Steven Sørli began his harpsichord making career as an apprentice of the famous Boston harpsichord maker, Frank Hubbard in 1971. He quickly became skilled in all facets of the craft and was especially gifted in the art of decoration. 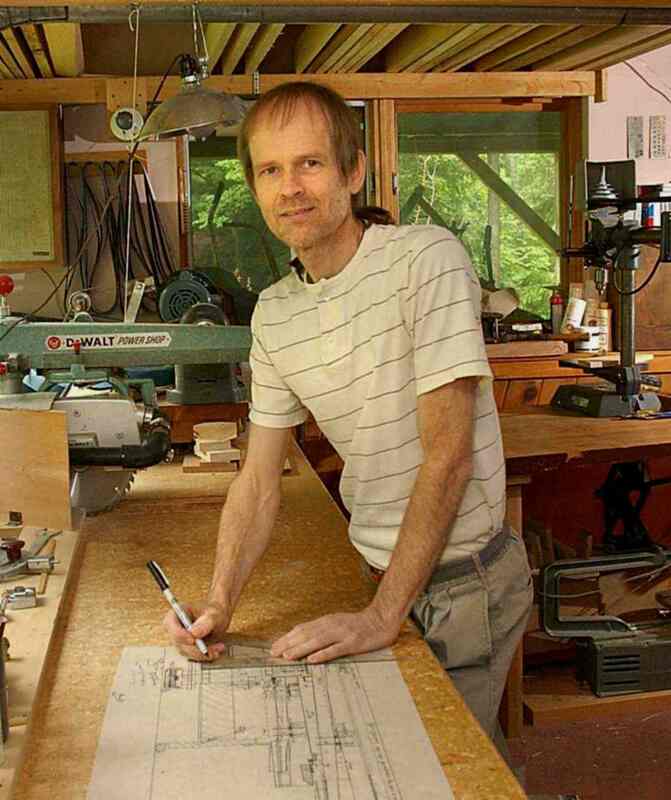 Steven set up his own workshop to design, make and adorn harpsichords individually from scratch. His construction process relies on intuition and ingenuity to ensure a serviceable and singular work of art. The sound qualities achieved by Mr. Sørli are often described as having a distinctive antique tone. Innate artistic abilities contribute to a tasteful blend of color and form that add a complimentary balance to the tonal shades. In 1982 he was awarded a craftsman's fellowship grant from the National Endowment for the Arts. Over 78 instruments have left his workshop and are scattered throughout the United States and abroad. At the turn of the century, Mr. Sørli began designing many models of the lute-harpsichord or lautenwerk. There are many words and spellings of this instrument including lautenwerke, lautenwerck, lautenclavicymbel and theorbenflügel (theorbo-harpsichord). An example of the plural form is lautenwerke or lautenwerken. This type of instrument was originally fitted with gut strings and sounds very much like a lute or nylon-strung guitar. The response to this revival of the lautenwerck has been quite positive. 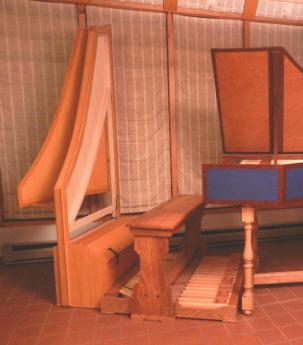 Mr. Sørli has also designed a remarkable hybrid harpsichord/lautenwerk in the 17th Century South German style. This double manual instrument features 2 brass choirs on the lower manual and one lute choir on the upper. In an effort to maintain the original type of sound produced by a small-sized case and to offer a practical compass of notes, the two keyboards are offset a fourth. The result is 5 extra notes when combining the available notes of each keyboard. The total compass is FF-d''' (58 notes) and the instrument is only 33" wide. The brass choirs have a sweet, ethereal and fluty sound. When the back 8' is played alone the dampers of the front 8' are off to allow a rich enhancement of sympathetic vibration. This effect is not usually available on a double that has the 8' choirs on different keyboards. The upper manual lautenwerk has two ranks of jacks playing the same choir at different plucking points and can be engaged together for a strong and textured lute sound. A dialogue between the two keyboards renders a colorful contrast in tone. Listen to this beautiful instrument in the "Sound Samples" page. New in 2017 is a pedal board clavicytherium suitable for practice or performance. 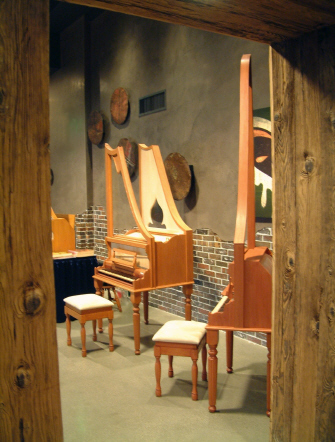 This original design stands behind the bench and player with a trestle stand in front to support any style or size harpsichord. 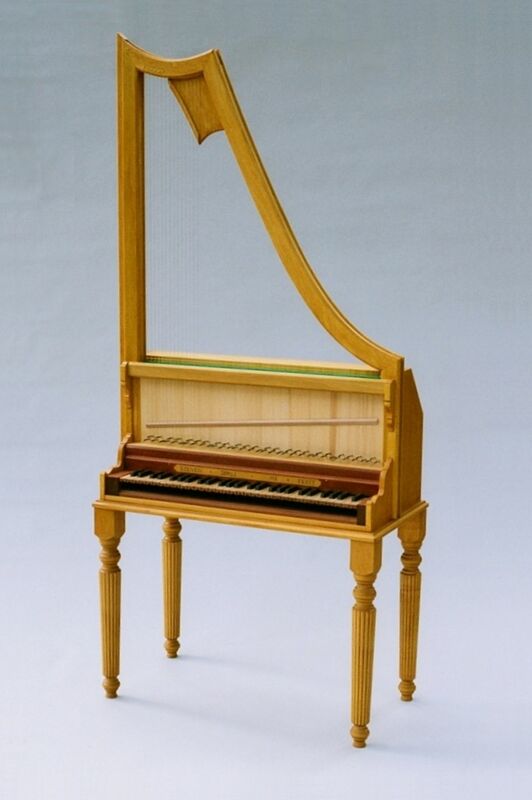 This is the only pedal harpsichord which provides the player with a perfect stereo balance of volume between the manual and pedal instruments. The standard decor includes birds-eye maple key tops with carved key fronts, walnut sharps, stained and painted case, intricate parchment rose, elegantly turned legs and tasteful music desk. All finishes are made from organically grown plant oils and resins. Also included are plastic jacks (wooden optional), unique transposing system (allowing some jacks with no dampers), regulating tools and a padded moving cover. Many standard models are available to order. Check the "Available For Sale" page for the instruments currently available for delivery. 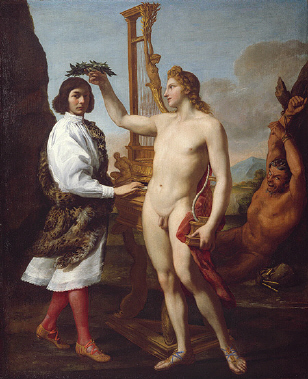 "Marcantonio Pasqualini Crowned by Apollo"